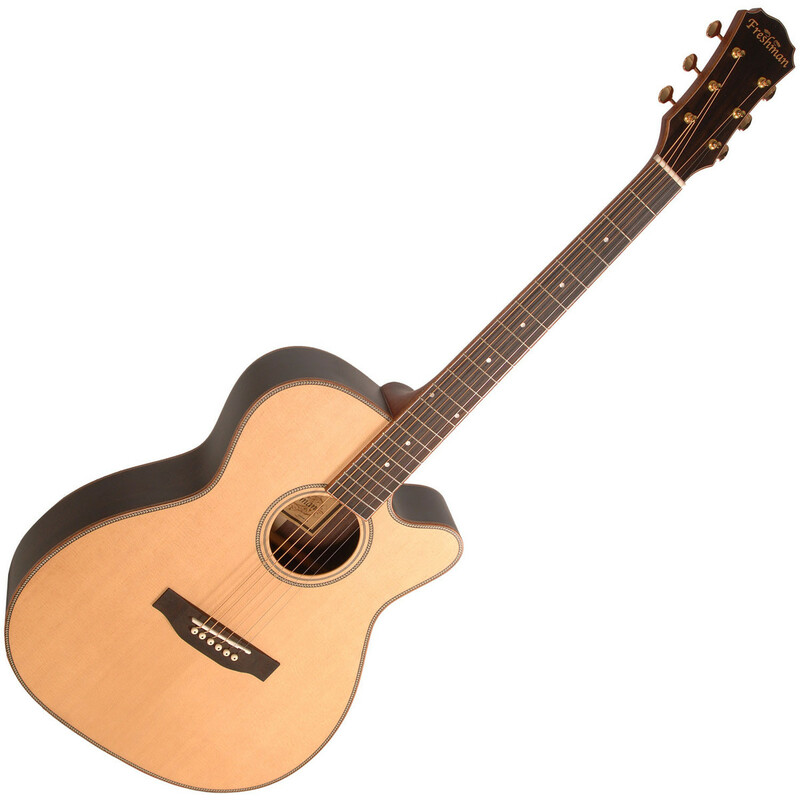 The Freshman Songwriter OM Electro Acoustic RW Guitar guarantees a balanced clarity of tone from the crisp top end through the mids and to end surprisingly full bottom end. It's ideal for fingerstyle but also has tons to offer when you start to strum. The addition of AER electronics makes the price all the more unbelievable. If your preference is for the time-tested brilliance of solid spruce and mahogany, and you appreciate the versatility of the OM body shape, there is no better choice than the SONGOC. With a sweeping cutaway you?ll be able to access the entire fingerboard, allowing you to sample the full breadth of the SONGOC?s mature, inspiring sound. Pitch perfect intonation and stunning harmonics marry together to produce a consistent blend that is both familiar and welcoming to the ear. The SONGOC is fitted with a premium AER Tube System. These outstanding electronics are exclusive to Freshman Guitars, developed and specifically voiced in conjunction with the world-leading German acoustic electronics company. The marriage of the two has resulted in a system that produces a true replication of the acoustic tone, unlike any other, and at an unbelievable price. Using a higher grade of tonewood than you would ever expect to find in this price bracket, the all solid SONGOC features a beautiful AA Grade Sitka Spruce top, and select Rosewood back and sides, all subtly bound with Mahogany and finished with Herringbone purfling. These higher grade woods will age perfectly, rewarding you every time you play, with clean lines and flawless finish a hallmark of the series.